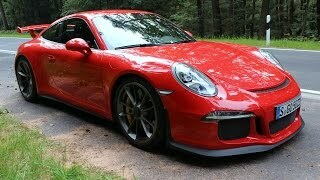 Porsche has officially unveiled the all-new fifth-generation 2014 Porsche 911 GT3 at the 2013 Geneva Motor Show. 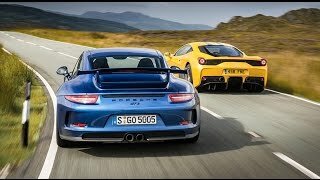 The new 911 GT3 is set to take on the pole position among thoroughbred Porsche sports cars with naturally aspirated engines. 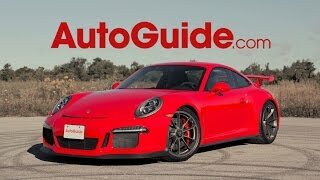 Described as a fresh chapter in the arena of high performance sports cars, the 911 GT3 gets an aggressive front fascia with spoilers and optical LED headlights, extended side skirts, fixed rear wing, widened rear fenders, a new rear bumper, center-mounted dual exhaust system and 20” forged alloy wheels. Power comes from a 3.8-litre six-cylinder flat engine developing 475 hp (350 kW) and 324 lb-ft (438 Nm) of torque. 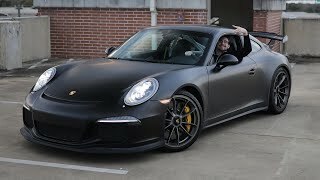 The engine is connected to a Porsche Doppelkupplung (PDK) double-clutch gearbox and high-traction rear-wheel drive. It accelerates from 0-100 km/h in 3.5 seconds and gets a top speed of 315 km/h (195 mph).